Poor Flexibility: This stops golfers getting into key positions without altering the spine angle during the swing. In order to rotate around good and stable posture, golfers must have good flexibility in the hips and shoulders. Muscle Stiffness: This can alter good set up posture and force players to change their spinal posture during the swing. No separation of the upper body from the lower body: This allows the shoulders to rotate around the spine without altering original posture. 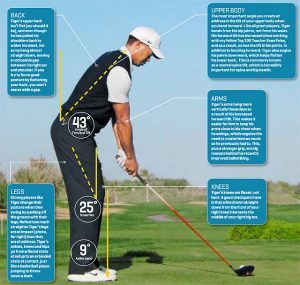 Inability to stabilise the core: The golfer’s ability to stabilise the angle of the spine during the swing, is directly proportional to the strength and stability of the core muscles (hips and glutes). To summarise the above, it is really important to have the correct posture before and during the golf swing. The golf swing is a very athletic motion where the stance and posture should be athletic as well. Working hard to improve your set up positions, and flexibility will help you to achieve a more consistent and better golf swing, leading to better performance and ultimately results.